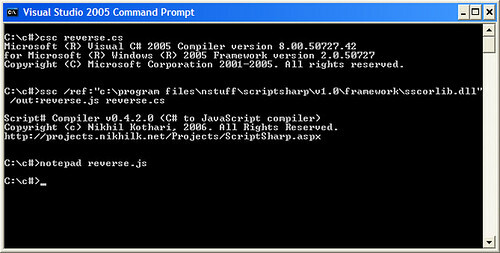 Nikhil does a very good job of warning you that the Csharp code must compile. But he does not, of course, tell you want would happen otherwise. The above code is valid C# [Of course ;)]. 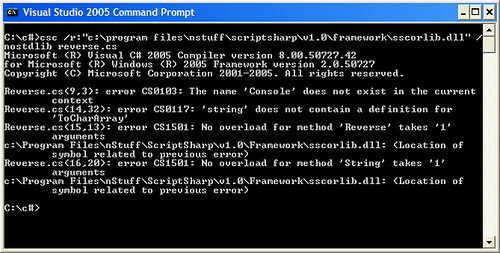 What is more interesting is that even the Script# compiler doesn't complain. What the heck? Where's the rest of the file!!! Hidden in the recesses somewhere [I don't remember where] there was an ominous line warning that your code MUST compile before you can turn Script# compiler on it.